Why ski the Stubai Valleys? The ski resort of the Neustift is the main destination serving the Stubai Glacier, and as such offers snow guaranteed, high altitude skiing that is best suited to intermediate and beginner skiers. Neustift has a ski area accessed from the village – the Elfer Lift and also the ski resort of Fulpmes-Schlick is in the adjacent village. All the ski areas are connected by regular free ski buses. 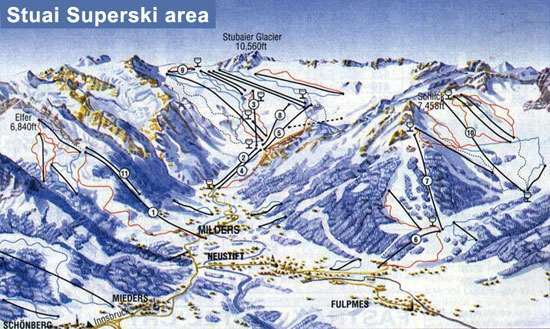 The main draw of Neustift is however the Stubai Glacier which offers over 100km of wide and snow-sure ski pistes. Neustift is the main resort serving the Stubai Glacier and it is the base of all the ski schools as well as offering a wide range of amenities. The lift system is modern and there are good child care and ski school facilities for children located at the mid station on the glacier. The skiing is best suited to the intermediate or beginner with wide gentle slopes. Advanced skiers can explore the off piste or the small number of difficult ski pistes. Ski touring is also popular on the Stubai Glacier. Neustift is a ski resort with a large number of hotels and ski chalets, most of which are built in the traditional style, and is set amongst great natural scenery. The resort is already known for its great snowfall and skiing conditions so not many snow cannons are needed. However there are a few snow making facilities across the pistes which gives skiers that extra guarantee for great skiing throughout the course of the winter season. Another good feature of a holiday based in Neustift is the proximity to Innsbruck. Buses from Neustift are regular and efficient and Innsbruck offers city amenities as well as great transport links including an international airport. Great shopping and dining all set in a dramatic and historic city. There are many airports that surround the Neustift ski area all of which are accessible via bus transfer or a short drive the closest being Bolzano which is one hour and a half drive away. Having just spent 4 weeks in Neustift I would VERY highly recommend it for a holiday! I think the glacier was closed all of 4 days for the entire month! They had regular overnight dumps and it is a very welcoming resort... especially Marty and Tamar in The Dorf Pub! It is compact enough that you can keep the group together but still has a wide variety of piste to explore... you should definitely check it out!